This season of the Walking Dead was released last year and I did a review in early January for Episode 1-2. Episode 3 was released in March, 4 came in April and the last one, 5, was released in May. I got distracted by some other games but I have circled back around to finish this chapter in this series. I’ll do my best to avoid spoilers. Episode 3-5 pick up with Javi trying to survive and find the rest of his family. There will be new faces to run into and some old faces such as Clementine. I ran into a few more gut punch situations once again. These involved asking: do I keep this character? kill them off? As always, what will this impact? Who will suffer? What will happen at the end? I feel as if this season wasn’t as heartbreaking as the last season where certain long standing characters were killed off. I also felt season 2 left gamers with a lot of questions at the end. 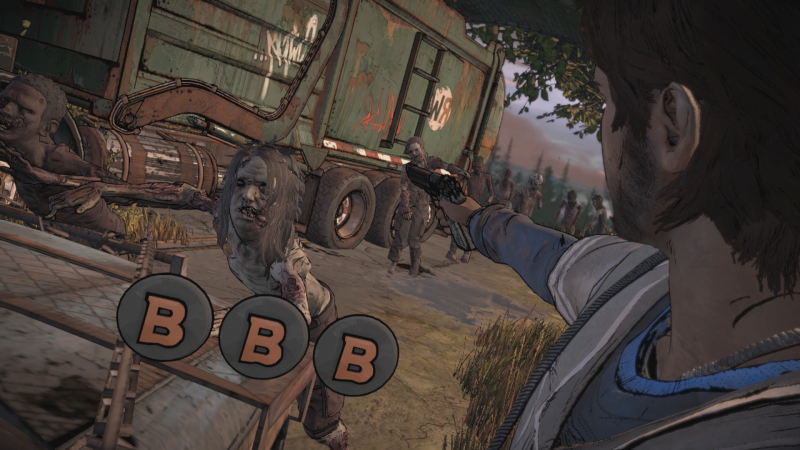 Where would Telltale take the series next? The first few chapters did a good job of setting up the game and introducing characters. Overall, without going into a lot of details I feel the choice the players are thrust into during New Frontier, by the end leaves fans on a better note. But on the same note, due to the ending, it is very hard to see where the game is going next with the series. The controls will work great. As I mentioned in my review of episode 1 and 2, there is a lot of action and this continues in the next 3 parts. As usual, I enjoyed the music and undead sound effects. Other gamers have mentioned the game engine is starting to show its age. This is primarily due to the age of the game engine. I also ran into bugs where one companion had died, but showed up in the next scene. Nothing game breaking where the game crashed several times like with some of the earlier seasons. Crowd play is an option if gamers are playing with a bunch of people. This is an interesting feature that I wish I had utilized. Season 3 has wrapped up and once again Telltale has shown gamers there is still plenty of life in the Walking Dead. The game is available on everything. It is usually on sale on Steam, Amazon has it for $14.99 on PS4. If gamers are looking to play season 2 and 3 of the Walking Dead there is also a collection for that. Big thanks to the publisher for letting us review this season.